These days, you have a lot of different options when it comes to how you want to give birth. While no option is going to offer a pain-free experience (if only! ), some delivery methods could prove to be better suited to your needs and preferences. Ideally, you’ll want to choose your delivery method long before the third trimester kicks in. That way, you have a lot more time to prepare, practice and create a backup plan for anything unexpected which may crop up on the day. If you’re still undecided on which delivery method is right for you, or you’re even unsure what your options are, below you’ll discover everything you need to know about the various methods available. Vaginal delivery remains the most common type of birth, with the baby arriving through the birth canal. Labor will start when the cervix starts to dilate and your waters break. It’s the most natural way to give birth and tends to result in fewer complications than other birthing methods. However, that isn’t to say things can’t go wrong. As with any type of delivery method, risks and complications can arise at any time during the labor. Although other birth methods don’t necessarily hamper the bond between you and baby, natural vaginal childbirth does tend to increase the bond felt right after the birth. You’ll also feel a sense of achievement that you got through a vaginal birth. The faster recovery process and fewer risks of complications are also a huge benefit, though obviously vaginal births do still present some risks and complications. So, what about the downsides? Well, vaginal delivery can be really unpredictable. You never know how it is going to go or what issues might arise on the actual day. You need to be prepared that in the event something does go wrong, a different delivery method may be required. This type of childbirth can be carried out in a hospital or at home. More information on both of these options can be found further down this blog. Now, this method is for those who have previously had a baby born through a C-section. In the past, having a C-Section meant that future vaginal deliveries were pretty much impossible. However, the way C-Sections are performed has changed dramatically over the years. Now, thanks to a surgical method known as VBAC, it’s possible for women to go on to have natural, vaginal births. So, if you’ve previously had a C-Section and the VBAC method was used, it’s definitely possible you could choose to have a vaginal delivery this time around. Caesarian sections, or C-Sections as they’re commonly referred to, tend to be used as an emergency method in case things go wrong during the labor. However, some hospitals do allow pregnant mothers to choose this form of delivery even before complications arise. With this method, a surgical incision will be made into the abdomen and uterus. The baby will be delivered via the surgery without passing through the birth canal. There’s a number of reasons this method may be required. As well as complications, C-Sections can be used for multiple babies (twins or triplets for example), babies which are larger than they should be, and for babies which are in the breech position. Many pregnant women have chosen to have a C-Section in the past because they mistakenly felt it was easier than vaginal childbirth. The truth is, a C-Section isn’t any less painful. It still comes with a lot of complications and issues you likely won’t have thought about. So, if you thought this was an easier way out, you might be in for a bit of a shock if you go ahead and have one for this reason! C-Sections can prove essential when complications do arise, but ideally, they should still be used as a last resort. Over the years, water births have become really popular. They involve a vaginal delivery, but the mother is partially submerged in a pool of water. Largely, it’s said to help with delivery due to its ability to use gravity to help baby to come out easier. However, it’s also said to have great pain-relieving benefits too. The pros of this type of delivery include its obvious pain-relieving benefit, as well as potential faster delivery. As you won’t be so distracted by the pain, you’ll be able to focus much easier on each contraction and pushing at the right time. This in turn speeds up the delivery process. The water is also said to soften the tissue, ensuring it stretches easier and reduces the risk of a peritoneum tear. However, there are a couple of major disadvantages with this method. If something does go wrong for example, you might not be able to receive help fast enough. There’s also an increased risk of infection with water births which you should be aware of. A home birth isn’t as popular today as it used to be, but it is still an option available to you. When you choose this method, you’ll basically be giving birth via vaginal delivery, but without any pain medication. Understandably, many women worry about the effects pain medication will have on their baby. Or, they simply don’t want medication due to their own personal preferences. Provided they are having a “low risk” pregnancy, this type of birth can be ideal. In fact, if you are having a low risk pregnancy, a home birth can potentially be even safer than a hospital birth. The pros of this type of birth include the fact you’ll feel more relaxed due to being in familiar surroundings, it’s less expensive and the risk of complications arising due to medical purposes are virtually nonexistent. However, a home birth can be messy, you’ll need to file your baby’s birth certificate yourself and if something does go wrong you’ll need to be moved to a hospital right away. Hospital births do tend to be the most common due to the range of pain-relieving medications available. It’s also reassuring to be surrounded by doctors and nurses in case anything goes wrong. You can be monitored at the hospital and if anything does go wrong, immediate treatment can be given. Once baby has arrived, there will also be professionals there to take care of them. However, the downsides include the fact that hospitals do have a high rate of C-Sections and they also offer very little in the way of privacy. As you can see, you have a lot of options when it comes to childbirth. It’s highly recommended you decide early on which method you’re hoping to go with. However, you should always have a backup option in mind too just in case complications do arise. From my observations, it’s a lot more fun for mothers to deliver their baby using the natural vaginal childbirth process. I can remember being at the hospital when my wife put to bed and her fellow mother in the ward was carrying that she had to use C-section to give birth, I actually felt the pains in her tears. I have seen water birth mostly online in social media network, it looks amazing but I’m not sure if my wife would fancy giving birth using that method. Personally, I prefer the natural method because it doesn’t pose a lot of hassles after birth – movement is not restricted, recovery is faster, etc. All my kids were born thru vaginal childbirth. Women who have had C-sections say they still feel pain even after their kids have become adults, especially in cold weather. Your categorization looks funny to me. Normal delivery (vaginal birth): This can be at home or hospital. C section: baby is born through Cesearian. Home birth is also vaginal birth. Since there is no proper medical attention, home birth can be risky. The hospital birth can be C section as well as vaginal birth. You’re right, vinaya, childbirth can only be vaginal or C-section. The childbirth options mentioned in the article are the types being used now. 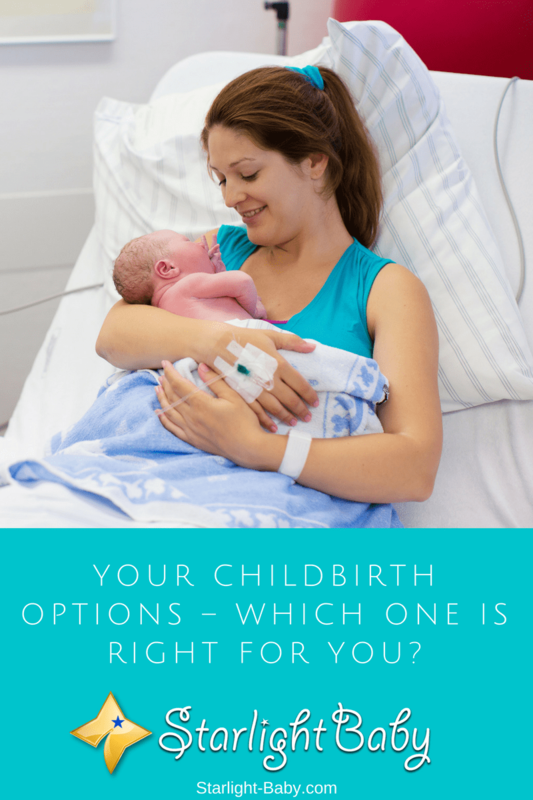 Childbirth options have evolved over the years so women now have a lot to choose from but women should be prepared for anything in case their preferred birthing option doesn’t work. Understanding the list of options we have as regards childbirth is one key element that mothers should have in mind for that is going to enable them prepare better when they are pregnant about the coming of the baby. These series of options mean that mothers should take a look at them and ensure they make the best with less complications to them when they deliver. Medical professionals have got a role to play on this as well.